Do people go to Atlantic City for any reason other than gambling? Sure they do. The city is a major draw for conventions, corporate meetings, and morale-building events. Atlantic City is also a major wedding destination. The city offers a combination of nightlife perfect for bachelor parties. Women love the town's upscale beauty, which makes it an ideal wedding backdrop. Atlantic City is in the middle of a massive suburban and even rural population, but it's only a short trip by car or train from New York City, Philadelphia, and a few other major cities. Not everyone who comes to AC is coming to gamble. In fact, increasingly, fewer people who arrive on Absecon Island are planning to gamble at all. This is a big problem for the casinos, but a big help for people who are visiting or moving to the city who have no interest in placing bets. Atlantic City was originally a resort town, a natural landscape of beaches, dunes, and bays at the southern tip of New Jersey. Once, the area was dotted with tiny health spas and resorts catering to the wealthy. Though legalized casino gambling (a product of 1970s economics) changed the face of AC forever, the now-$3 billion industry did nothing to wipe out the natural beauty of the place where it was built. As the casinos disappear, you have an opportunity to enjoy the area for its original purpose as a haven from the big city. Yes, Atlantic City is a small town of just 39,000 people or so. It has a certain small-town appeal, especially if you travel a mile or two south. Attached to the city (mostly to the south) are several small suburban neighborhoods that function as independent cities. Towns like Ventnor City and Margate swell the local population and provide a lot of places of interest to tourists. 26 million people visited Atlantic City last year, and fewer than forty percent of them placed a bet in a casino. They got to the city mostly by car, though some arrived on a plane or by rail. Tourism is still a major part of the local economy – which is why the city is perfect for visitors who aren't planning on darkening the door of a casino. 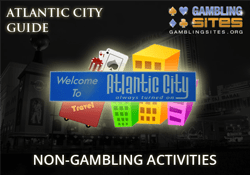 So how do you decide what to do in AC if you aren't interested in gambling? You can start by reading the tips offered on this page. You can also take a look at some of the activities we recommend, in four separate categories. If you want to jump straight to one of these categories, please use the relevant button below. The easiest way to figure out what to do in Atlantic City is to answer four simple questions. The answers to these questions help narrow down your choices. You can add questions if you want – that'll narrow down your choices even more. The answers to these particular questions do tend to get people on the right track toward picking an activity in the AC area that's not in a casino though. Atlantic City has the Atlantic Ocean for an eastern border. It's also located in a fairly active part of the country, weather-wise. Ice and snow in the winter months mean that your best bet in terms of weather is the months of May to September. The average high for the months of November to February is 44 degrees; the average low for those months is a chilly 29 degrees. It's not a great time to do anything BUT sit in a casino and place bets. But if you're there between May and September, you'll find warm days, temperate nights, and lots of sunshine. If your visit is during the cold months, you'll want to stick to lots of indoor activities. AC gets about 20 inches of snow a year, so you might find yourself snowed in. Don't worry. There's still plenty to do in AC indoors besides sit at a slot machine. If, on the other hand, you're in the area during the warm months, you should DEFINITELY set some time aside for the many outdoor activities available in the area. Your options for entertainment and activities vary depending on if you have any kids in the crowd. If your group is made up mostly of adults, you have a lot more choices. Atlantic City is family-friendly, but many of the options are geared more for grown-ups than kids. Do you need entertainment to fill an hour? Do you have an entire day to kill? The amount of time you need to kill also plays a role in determining what activities you choose. Much of AC's charm comes from the part of the country where it lies, so some of these activities require a journey. If you have extra time, you have a wider range of activities to choose from. Did you come to AC looking to spend big and experience a little luxury? Plenty of activities are right for your budget. Do you have a day to kill and not much money to spend? We can help you there, too. The trick isn't spending a ton of money. It's matching your budget to activities that are available and having the best time you can for what you want to spend. Most activities below cost some amount of money, though we've intentionally included both inexpensive and high-dollar options on purpose to show range. Now that you've thought about the four most important factors, look through the lists below. They contain a great selection of recommended activities in the Atlantic City area, and none of them involve gambling. These ideas may inspire you to think of your own activities – that's great! So long as you stay within the parameters of your answers to the questions above, you'll have a great time. Even after a spate of casino closings and a general downturn in the city's economy, Atlantic City still appeals to big spenders who don't want to make the cross-country trip to Las Vegas for their casino gambling, wining, and dining. The following activities are designed for guests to the city that are expecting some of the finer things in life, regardless of the cost. This is not your father's steakhouse. Bobby Flay's steakhouse at the Borgata serves $50 steaks like they're appetizers. They also have specials, rare wines, and multi-course tastings available at three and four times that price point. You're going to spend some coin for a meal at this spot, but it's the glitziest of AC's many steakhouse-themed eateries. It's also the place where you're most likely to see celebrities grabbing a bite before or after a show at the casinos. AC's newest boutique hotel is actually part of Borgata – a very successful part. You can take your pick from gigantic lofts to smaller guest rooms, all built around a theme of "luxurious elegance," according to the Borgata's website. You can pay anywhere from a few hundred to well over $1,000 a night at this smaller and ritzier cousin to the popular Borgata next door. As an added bonus, you'll be as far away from the gambling as you can get and still be in a five-star hotel in AC. Make a reservation online for special deals and offers to local businesses. The place where the continental shelf meets the deep part of the Atlantic Ocean is called the Canyons. During the summers, canyon runs are the main fishing event in an area known for its excellent fishing. You can charter an overnight trip for a small group to "run the canyons" for tuna, shark, and other big predators, but you'll pay for the privilege. At the cost of around $6,000 per day, you can have the run of a 60 foot ship, a crew that knows how to run the canyons, and breakfast, lunch, and dinner. Several companies make these runs – so take a look locally and make your pick. Make a reservation early. The Knife and Fork Inn tends to fill up, especially during peak tourist season. The Knife and Fork is special – it's probably the closest thing to a traditional gourmet restaurant that's available in or near Atlantic City, not counting the lovely restaurants up Atlantic Avenue in the "suburbs" of Ventnor and Margate. The Knife and Fork is home to a world-class sommelier, as well as a library of 300 rare and connoisseur-level wines. Drinking in a place popular among Prohibition-era gangsters? Nothing's more AC than that. We're going to use Immersion Spa as our example here. It's at the mega-popular and mega-ritzy Borgata, and because they have luxury packages for couples that will set you back as much as $1,400 a night. Atlantic City has always been a big area for spas, resort treatments, and natural beauty. They have high prices, but if you're on a budget, you can book treatments at rates much lower than this. If you want to give Immersion a try, you can reach them at. Because AC is so close to a lot of different big cities and interesting parts of the country, you can take day tips by car to have a number of different experiences. All of the ideas below are within a day's drive of Absecon Island, and many of them are built around family-friendly activities. Take a thirty-minute drive south from the city (and pass over two toll bridges) and you'll find yourself in historic Ocean City. Ocean City is a family-friendly seaside resort. There's no drinking in public on the island that the city is built on, and most activities are designed with the entire family in mind. Frequently rated the top family beach in the country, Ocean City is a hidden jewel just a short drive from the hustle and bustle of AC's casino industry. If you arrive in AC by plane or train, you may not realize just how close Philadelphia is. An hour by car, a little longer by a special express train, and you and your family or friends can be checking out the Liberty Bell. If driving isn't your thing, revel in the awesome public transit system in AC and Philly, and spend about 90 minutes total getting back and forth from the City of Brotherly Love. The ticket will only set you back about $12. Philly is a cultural hotspot with live music, amazing food, museums, and other big-city attractions. Lancaster, Pennsylvania, the epicenter of the Pennsylvania Amish country, is less than three hours from AC by car. You and your group could easily travel, see the sights, grab a bite to eat, and be back in Atlantic City in plenty of time for evening activities. If you don't think Amish Country is cool, think of it as a giant outdoor bazaar and amusement park, and bite your tongue. Most people in your group will have a blast, and you'll spend next to nothing. Okay, so it's an eight-hour round trip. And yeah, that eats up a good chunk of your day. But if you can grab a nap on the way to and from the city, you'll steal those hours right back. Let's face it. NYC is the epicenter of everything cool about America. Live music, theater, art, amazing food, and that beautiful skyline – all this can be yours for a $30 ticket and a few hours napping next to a stranger. Some of the best bass fishing in the world is right in Atlantic City's backyard – along the inlets of the back bays of the Atlantic Ocean that lie on the other side of the city from the Atlantic. During the spring and summer months, the back bays are a hotbed of wildlife activity, including world-class bass and flounder fishing. You can easily spend a day seeing the wildlife, taking photos, and doing a little fishing. All you need is a willing guide – the area has plenty of fishermen willing to help you tour the area for a small fee. Cities built around gambling are not known as great places to be broke. Sure, you can find cheap buffets and earn comps at the casinos… if you're a gambling customer. What can you do in Atlantic City for free? The ideas below should get you thinking in the right direction. Few American beaches have boardwalks. None of the others are as long as the one in Atlantic City. Designed with people in mind, the boardwalk is wide enough to accommodate bikers, walkers, and people-watchers. You can get amazing views of the surrounding seaside and dunes from the boardwalk, or use it as a home base for a beach adventure or a stroll through downtown. Similar to the Bellagio Dancing Fountains of Vegas, Caesar's Atlantic City puts on a fantastic water show set to music. The entire show is seven minutes, but it only takes place once an hour, so getting a good seat is half the fun. Gardner's Basin is a tiny waterfront community located along the inlets of the back bays of the Atlantic Ocean. These days, it's mostly a string of restaurants built over the water and with emphasis on outdoor seating. You can sit and eat and watch the boats pass, but you don't have to buy anything to enjoy the view. There is also an active artist colony and lots of wildlife to watch along the way. A totally free tour of the Absecon Lighthouse would be the perfect free trip for a family with kids, or even a romantic trip for a couple. You can see amazing views of the AC skyline and check out an interesting little museum, including the worlds' first-ever Fresnel lens. It's a short trip from the city and they're open all year long. During the summer, AC has a very active Swim and Surf club that hold competitions for about a four-month span. Local surfers don't quit when the water gets cold, either – you can see surfers in wetsuits tackling the surprisingly-good local waves all year. You can find out about upcoming events on social media. Vegas has been rebuilt into a family vacation destination. Gone are the days when the casinos were smoke-filled caverns filled with desperate men gambling away their rent money. Today's Vegas is a kinder, gentler gambling Mecca. That change never really came to Atlantic City – at least not to the casinos. Look and you can find plenty of family-friendly experiences in and around AC. The famous boardwalk and beaches of Atlantic City are too often overlooked by casino customers. The city's entire eastern border is made up of beaches. Some five miles of the city is bordered by the boardwalk, which was the first of its kind in America. You won't spend a dime to hang out on the beach, swim, get some rays, read a book, and explore the boardwalk. It's a huge part of the city's heritage that can't be missed. And it's free. The Steel Pier is a historic site where an amusement park and concert hall and boxing arena once stood. The Steel Pier has been revived and renovated to make it a more family-friendly environment. And it's being expanded all the time. Future plans include the world's tallest Ferris wheel and further expansion of its restaurant and retail shops. Your kids can enjoy a few amusement park rides and other kid stuff, while the adults do a little window-shopping. Fralinger's is a local candy shop with history. Salt-water taffy was accidentally invented at Fralinger's in the early 20th century when a batch of taffy candy was ruined during a flood. The candy is still served worldwide. Your family can hit up the same location where it was invented. If you're lucky, you'll get a special quick tour of the facilities. Sure, your kids will get a sugar high, but they can walk it off at the nearby shops while you and the other adults do some window-shopping. Lucy the Elephant is a classic family-friendly attraction just outside of Atlantic City. She's also the world's only hotel shaped like an elephant. You have to see Lucy to believe it. Basically, it's an old-school hotel from the area's golden days in the 1920s, and she's still standing. You can tour inside of her, and eat at a couple of nice restaurants nearby, but the thing you absolutely MUST do is get a picture of you and your group with Lucy in the background. The Cape May County Park and Zoo is cooler than you might expect, considering it's a smallish county zoo. The zoo and park are well-maintained. It's a popular area, so it's well-supported by locals. The park and zoo are clean, the animals are active and healthy-looking, and they've done maintenance to make the park an amazing experience for all visitors. We can't recommend it enough, especially if you go on certain Saturdays during the summer, when all admission is free. Atlantic City has fallen on hard times. You can't write about the city without writing about the decline of the tourism and casino industries. But it's still a hub for entertainment. And lots of business meetings, conferences, and get-togethers take place here on the Jersey shore. Yes, the casinos are struggling, but that doesn't affect the quality or amount of non-gambling activities available at all. If anything, the city is reaching out for non-gambling visitors more than ever. They're also looking for new forms of revenue through things besides casino bets. As the city looks for new revenue, it's going out of its way to welcome guests regardless of their gaming preference. If you find yourself in Atlantic City, or just an hour away in Philadelphia or any of the other population centers nearby, the city is worth a look, even if you're not a gambler. We're sure you'll find that some of the twenty non-gaming activities suggested above work for you and for the needs particular to your visit.